As much as we would all love to travel all day, every day, most of us have to come back to the “real world” between travels, if for no other reason than to fund more travels! 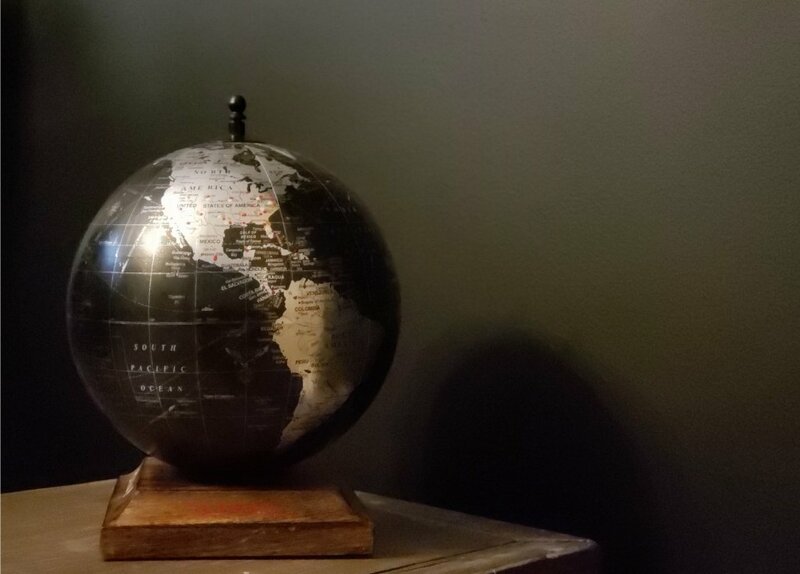 When I’m home between travels, I love having unique home decor pieces that remind me of places I’ve been, or decor that inspires me to seek out new destinations. Two years ago, my kids gifted me with the best Mother’s Day gift ever! A globe with each of their names written in a different color ink along the base that corresponded to dots on the various states and countries that they have traveled to. It warmed this mama’s heart to know that I raised kids who love to travel as much as their parent’s. The piece is one of the many pieces that I have in my home to help me to fondly remember the places my family has visited. 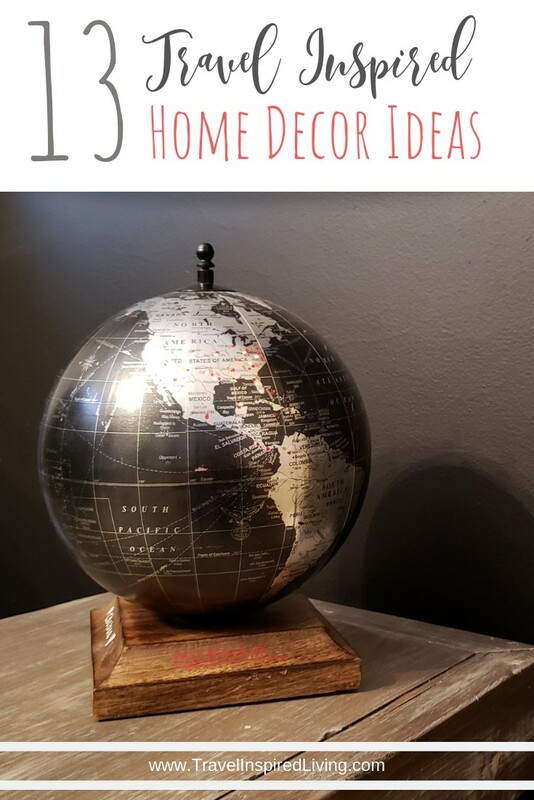 I love my globe so much that I asked other travel bloggers for their tips on re-living travels at home through home decor. Whenever we’re not traveling, we’re thinking about traveling. Our wall-sized world map from National Geographic serves as our gateway to other countries even when we’re stuck at home. The 9-foot by 6-foot map covers one entire wall of our bedroom and is dotted with colorful pins marking the places we’ve visited. Every night, after we’ve brushed our teeth and changed into our pajamas, we snuggle into bed and turn one of our bedside lamps toward the map. “Remember when we saw that huge herd of elephants in Tanzania?” one of us will say, the shadow of our finger pointing to the exact spot on the wall. Or, “I could go back to that amazing beach in Costa Rica…” And before we know it, we’ve both fallen asleep, dreaming of memories of past adventures. When you’ve lived as an expat in two separate countries, and taken advantage of many travel opportunities while you were at it, it’s easy to amass a lot of ‘stuff.’ Over the years, I’ve learned to hold onto the things that mean the most to me, or elicit the sights, sounds, smells and memories of places I’ve been lucky enough to visit or live in. They’re not ‘souvenirs’ in the traditional sense, but they are to me. Looking at the mosaic bull reminds me of a trip to Barcelona with my brother, where we wandered back streets and laneways in search of nothing in particular. Apart from some very cool street art, we came across a tiny shop, selling bits and pieces and I fell in love with this colorful bull. When I first moved to London, I did a homestay with a lovely family in the city’s North while I found my own place. I read Charlotte Bronte’s Jane Eyre from cover to cover in that house, all snuggled up and hiding from the snow outside. My silver hair clip came from a market in San Francisco, just after I’d moved here. 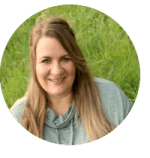 These reminders taught me that there are lots of everyday items that double as mementos and motivation for travel. 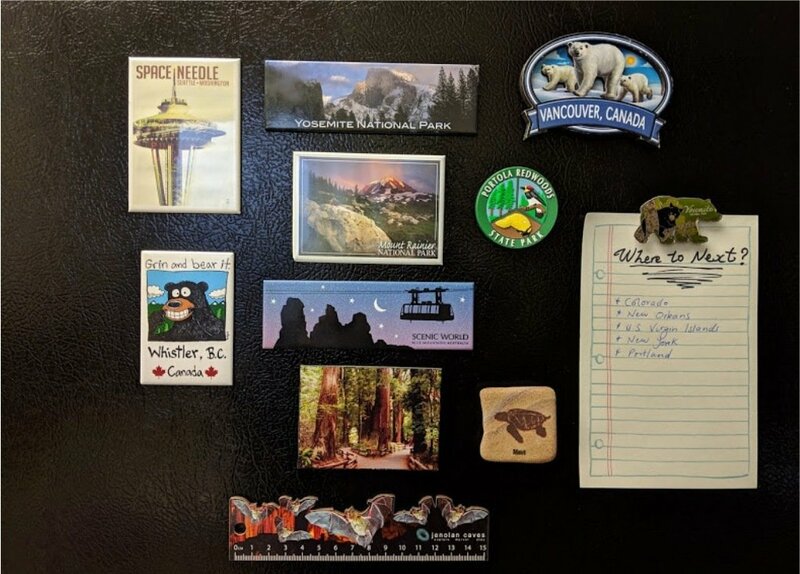 Fridge magnet collections might be considered a little kitsch or a throwback to your parents’ generation, but I really can’t look past them when I’m off on an adventure. Sometimes you don’t want to spend hours searching for the perfect piece of home décor to complement your burgeoning collection back home. Especially when you’ve only got a short time to explore your destination. I started my magnet collection by picking up my favorite at every National or State Park that I visited or camped in. Soon, it became a little something I’d buy while doing a postcard run. And now, when I’m cooking, or wandering into the kitchen for a snack, I catch a glimpse of Yosemite and think back to great camping trips when we saw bears and spectacular Yosemite views. Or I’ll see the snow-capped peak of Mount Rainier, and remember my first ever snow-shoeing experience. Never underestimate the ability of an image to transport you back to a special memory. One of my favorite souvenirs to collect from my trips are shot glasses. They are usually pretty inexpensive, small and easy to fit in a carry-on, functional, and can be found almost everywhere. It’s interesting to me that they vary in size depending on which country you are coming from, and easily tell a story of the places I’ve been. 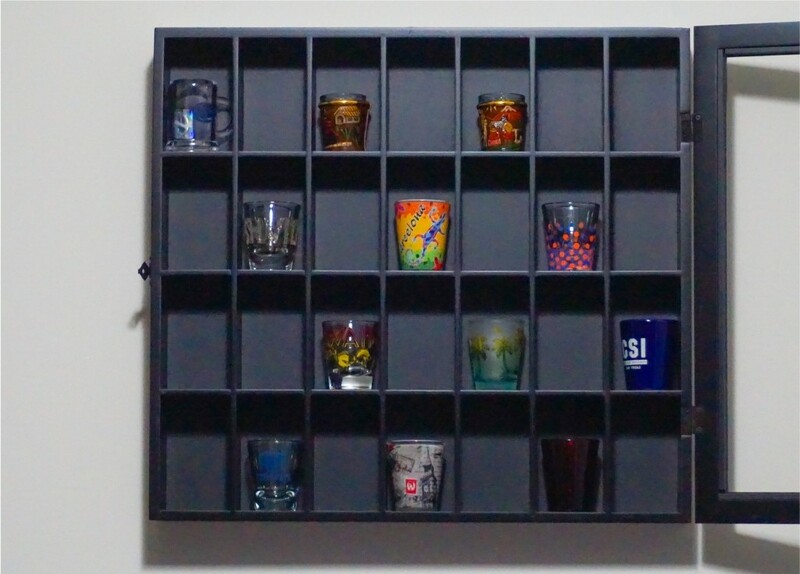 A few years ago for Christmas, I received a shot glass case that I’ve now put on display in my kitchen, which shows off my mementos from my travels and makes me want to keep adding to all the empty slots in the case. Some of my favorites include a set from Lima, Peru and a colorful frosted glass from the Bahamas. It’s a great way to look back on past trips and look forward to the upcoming ones while taking up little space! 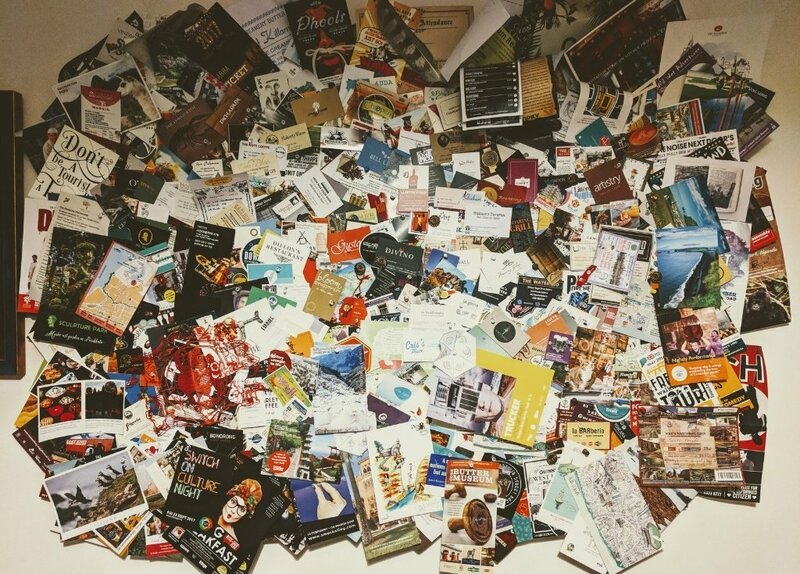 I find that I’m always picking up business cards, postcards, or flyers from the places we travel, to make it easier to remember all of those special little places that we encounter on the journey. Buy a push-pin board or corkboard from IKEA or any office supply store and hang it on the wall of your home office. 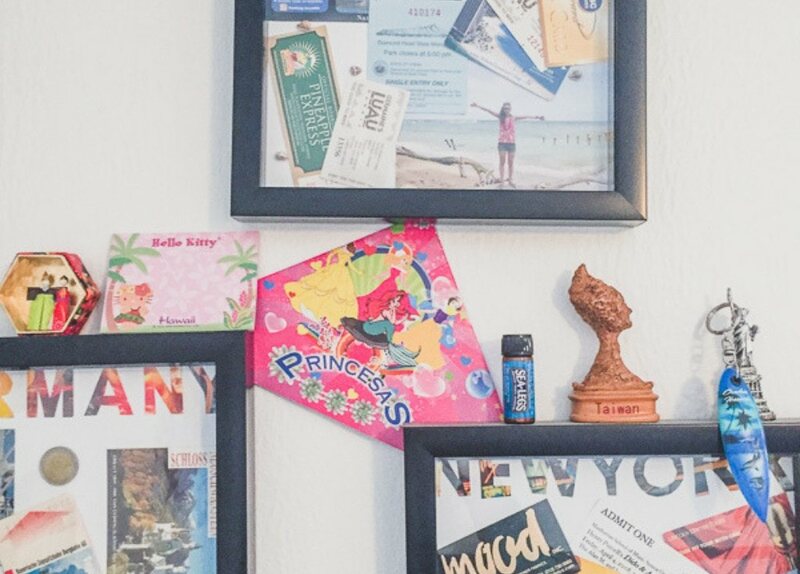 Now you can creatively pin-up and display all those little mementos and relive your travel memories in the process. 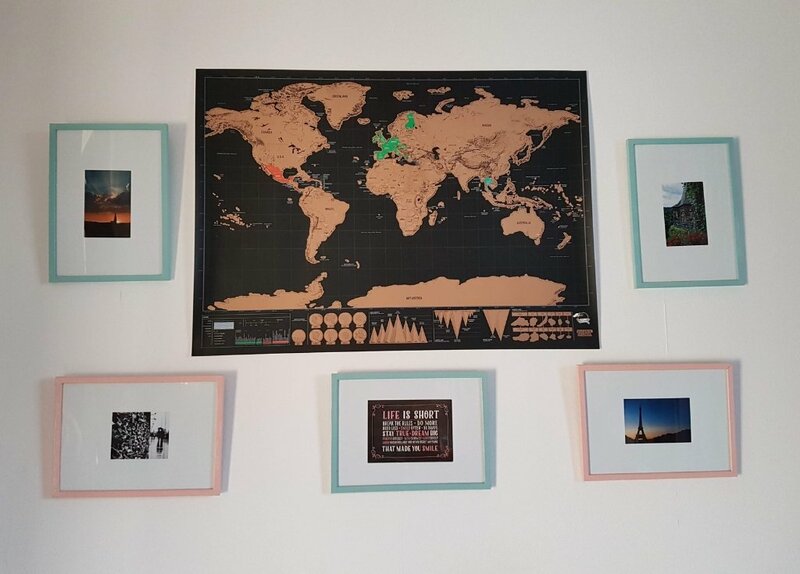 We chose to create our pin board with business cards and postcards but you could just as easily make one with ticket stubs from the places you visit. Add some specialty push pins to the mix and up your travel home decor game even further. We bought some travel-themed push pins with the Eiffel Tower and Statue of Liberty as pinheads. Voila! 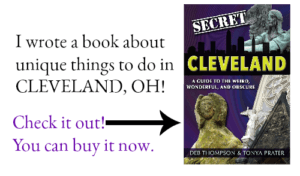 You now have your very own personalized travel work of art! Not long after I started using vacation time to explore the world, I discovered two truths about myself: I am not a scrapbooker, and I am not a photographer. Knowing I would never be able to flip through an album of ticket stubs and photos, I still wanted a way to visually connect to my adventures when I am home. Inspired by a big, empty wall in my home office, my souvenir wall was born. I purchase a single souvenir from each country I visit to hang on the wall. The rules are simple: the item cannot be expensive, and it should have a great personal story. Today, the wall tells the story of how I begged a man in Morocco to sell me an unfinished painting, the day I cried over artwork made by war survivors in Vietnam, and how I purchased a print from a cruise gift shop just after it crossed into Antarctic waters so I could say I (technically) bought it in Antarctica. 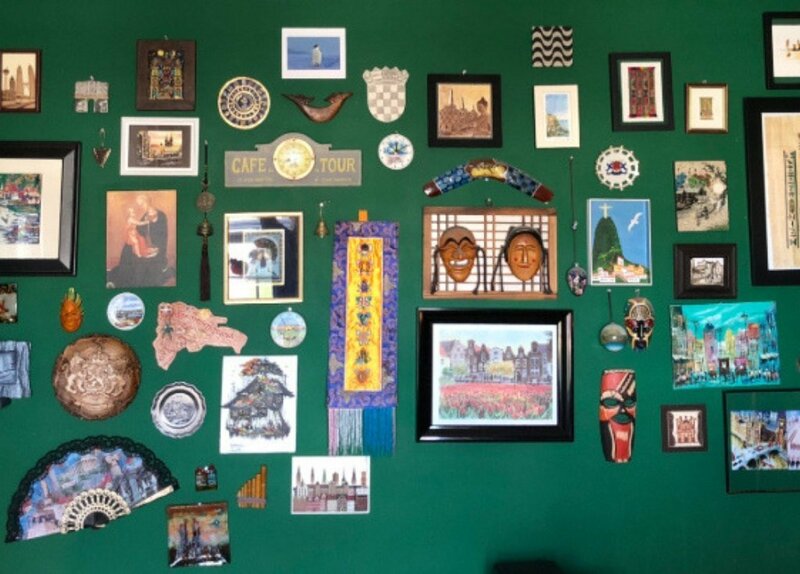 When I am home, my souvenir wall is a conversation piece as well as a powerful reminder of the places I love—and a representation of how travel has changed me for good. Besides taking photos of our adventures, we have also found simple mementos to relive our travels at home. For each country we visit, we purchase one miniature of the monument that means the most for us. It doesn’t necessarily have to be the most famous, just the one with the most beautiful meaning – A symbolic design, an amusing story, or merely an interesting legend. After all, the story doesn’t have to be real. It just has to make that moment special. 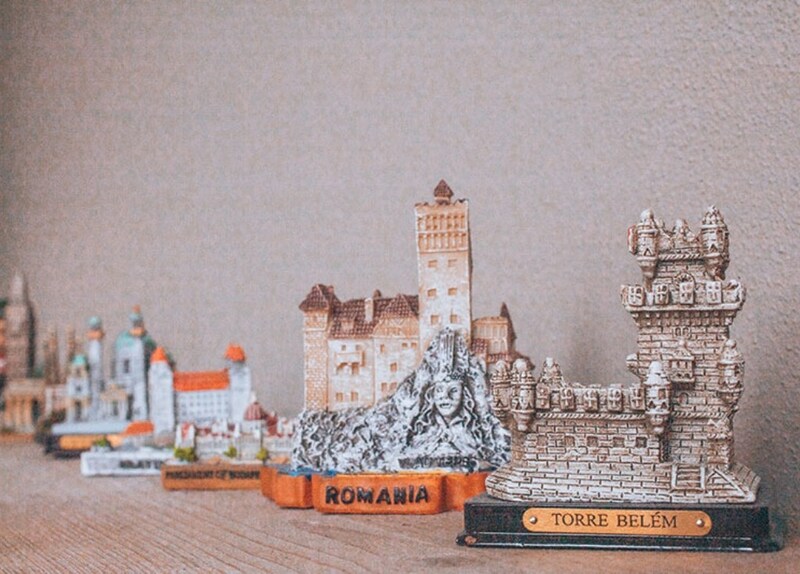 As our list of countries grows, our mini-city grows together, full of castles, towers, gates, and statues, creating a medieval world right here in our living room. I’m one of those people that takes home every ticket, business card, a piece of money, brochure and every little useless thing I come across, home with me. After accumulating a small photo box full of this stuff, I needed something to do with them. I remembered seeing a picture of a travel shadow box on Pinterest and I knew that’s what I would do. I headed out to the craft store to gather supplies for previous trips and started filling shadow boxes with the best things I brought home from each country or state I visited. I arrange and rearrange until it looks the best then glue dot everything down. Now, as I move around the country a lot, they stay hanging on my bedroom wall at my parents’ house and I get to enjoy them every time I visit. I don’t make one for every place I visit, just the ones I have enough things for, but these are a great way to display all the little stuff you’re just not sure what to do with. We take lots of photos when we travel so that we can remember all of the amazing places we visited and the things that we did on our trips. I don’t think we have enough wall space to display all of our travel photos. Instead, we use a digital photo frame, so that we can see our photos one at a time in a slide show. It’s so much better than storing the photos on a themb drive or in a drawer. I look at the frame and it helps remind me of all my travels. Plus, it makes for a good conversation starter. 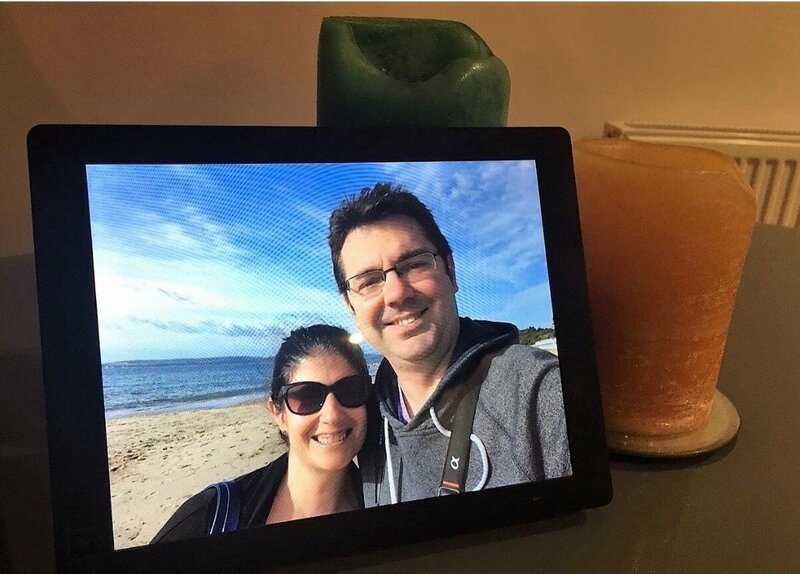 With our Nixplay digital frame, It’s easy to add the photos via an app. It all started when my friends gave me a scratch world map as a goodbye present. I have always loved travel and it was something that, although I have always wanted, I have never dared buying. To by honest, it felt like a waste of money that could be spent on plane tickets! It was a beautiful present and by scratching off the areas that I have visited I realized how little I have seen of the world. I am working on scratching more, though! I usually change the pictures around it every couple of months, although the quote in the center I leave there, to be inspired and try to live by it. 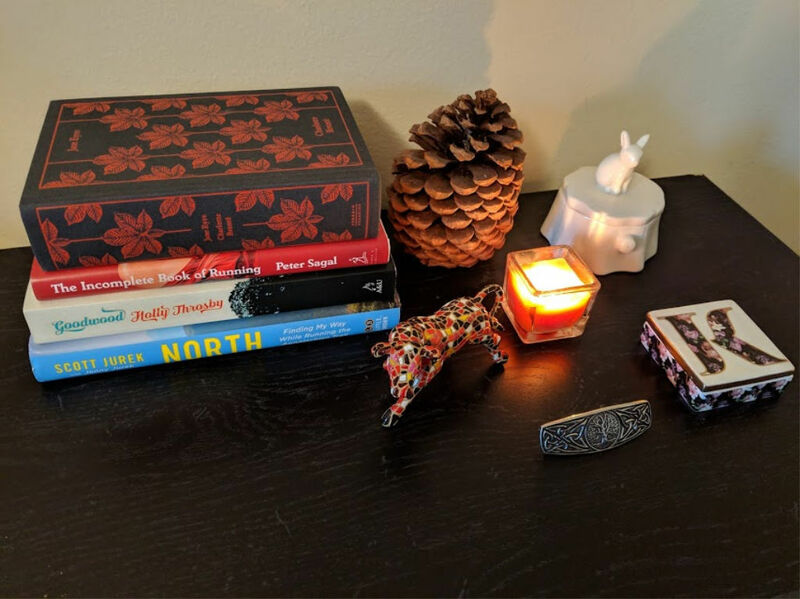 When moving into my first apartment, I was so excited to be able to decorate my own place for the first time. 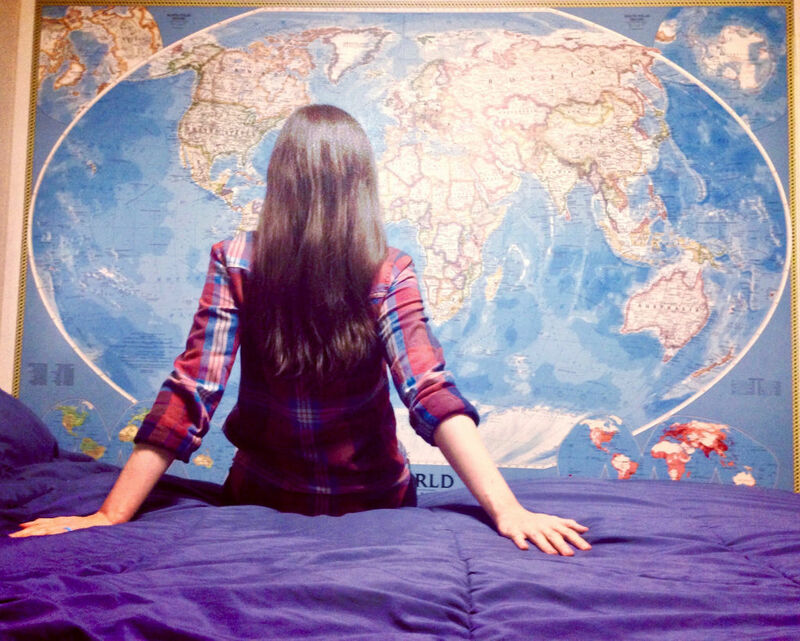 I wanted it to reflect my love for travel, but I wanted more than just world map posters on the wall. I wanted something that would be a conversation starter, and then, by a stroke of luck, I found these awesome throw pillows with airport codes on them. 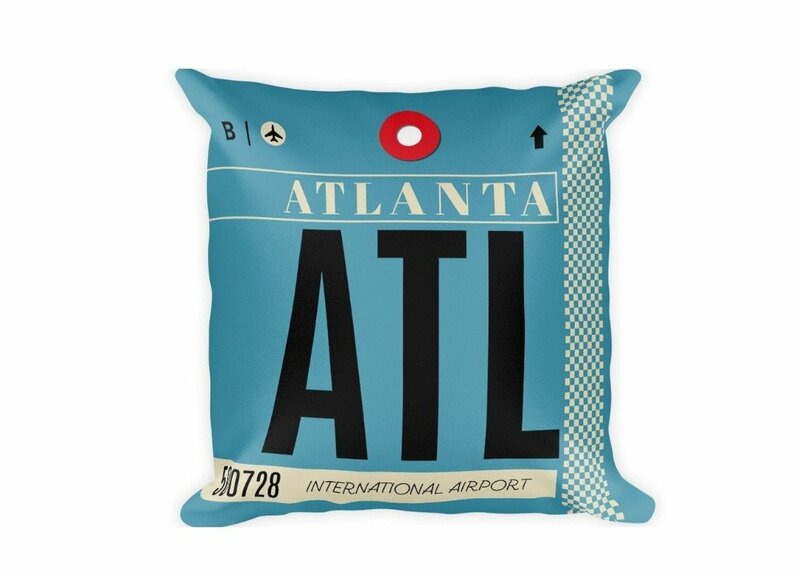 I could get pillows that would represent all of my favorite airports. Plus, they were a great conversation starter for when company came over. I thought they were a fantastic way to incorporate travel into my home décor without being overly obnoxious. When I’m not traveling, I love to dig into my craft closet and start on some DIY projects. I have made pressed penny jewelry, designed my own canvas wall art and created these easy DIY photo coasters. These are so easy! 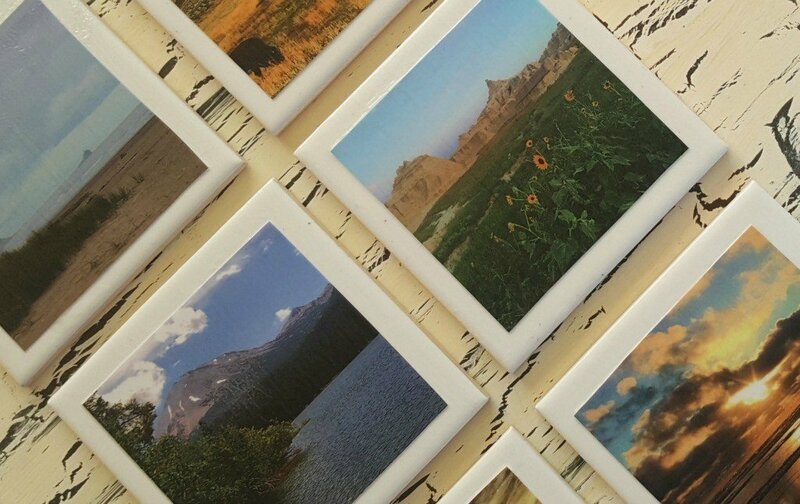 I only used inexpensive ceramic tiles, Modge Podge and some of my favorite travel photos and every time I use these to protect the surface of my wooden table, I’m able to relive the first road trip my husband and I took as empty-nesters. What souvenirs or pieces of home decor do you have around your home that help you to reminisce about your favorite places?